Chainsaws offer a unique capabilities for clearing trees and large brush. It is essentially the go to tool for this task and is synomous with tree removal, cutting logs, and pruning. 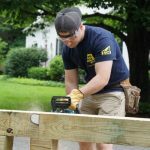 The Chainsaw is also adept at cutting both unprocessed lumber, efficiently cutting large posts or beams, or landscaping timbers. The Makita 18V X2 (36V) LXT Lithium‑Ion Brushless Cordless 14″ Chain Saw provides users with the capacity to complete all these task with the additional convenience and safety of a battery operated saw. 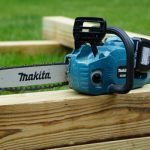 In this Makita 18V X2 (36V) LXT Lithium‑Ion Brushless Cordless 14″ Chain Saw Review we’ll highlight the advantages of cordless OPE, like Makita’s ever growing 18V X2 (36V) line. Including Makita’s 18V X2 (36V) LXT Lithium‑Ion Brushless Cordless Blower, check out our review. 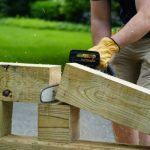 Cordless Outdoor Power Equipment or OPE has many advantages, but specifically for chainsaws I’m especially impressed by the safety benefits of this cordless version! We’ll explore ALL the advantages in the review below, but first lets get into the Features and Specifications. Net Weight (with battery) :11.5 lbs. The Makita 18V X2 (36V) LXT Lithium‑Ion Brushless Cordless 14″ Chain Saw is a great alternative to traditional gas powered saws for professionals and homeowners alike. Benefits of cordless battery operated chains saws include no emissions, less noise, and little maintenance compared to gas powered units. You could get similar benefits with a corded chainsaw, but of course you’ll be tied to the cord and it’s power source. With the amount of maneuvering needed for many chainsaw tasks a cord can be cumbersome. Additionally, corded tools are a liability in wet environments. Makita’s 18V X2 (36V) LXT Lithium‑Ion Brushless Cordless 14″ Chain Saw is better suited for damp environments and requires no gasoline, no approved safety cans, but does require chainsaw oil to lubricate the blade. The chain is oiled automatically during operation, but must be filled with 200 millimeters of oil prior to use. For storage, the saw should be cleaned the chain and bar lubricated under no load, then the oil drained. The rate of oil can be easily changed with the adjusting screw located on the bottom of the saw. The two 18V batteries power the saw with 36-Volts that allow the tool to start up instantly. No struggle with a pull cord to get the tool started. 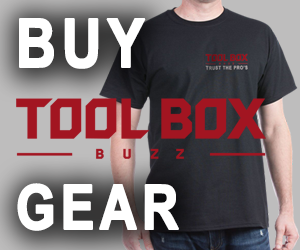 No noise when the tool is powered on unless the chain is engaged and even then there are zero emissions during operation. 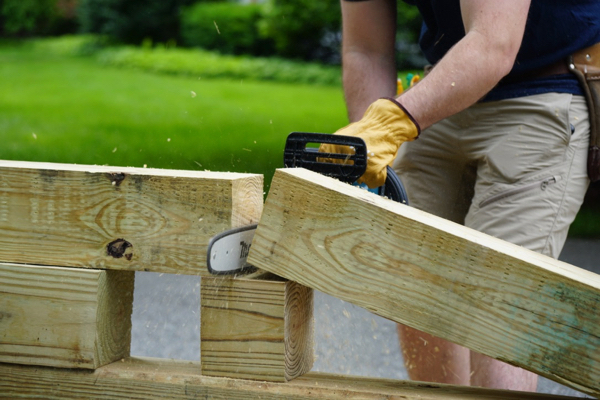 The convenience of a battery operated chainsaw makes it less intimidating for homeowners. 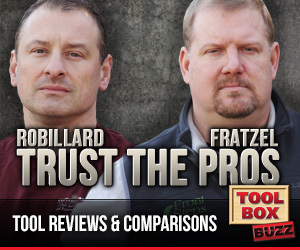 The inherent safety associated with cordless tools versus gas powered tools is a great advantage for contractors. The Makita 18V X2 (36V) LXT Lithium‑Ion Brushless Cordless 14″ Chain Saw starts instantly preventing the frustration of a pull start gas powered tool. This frustration could lead to unsafe practices like a drop starting. 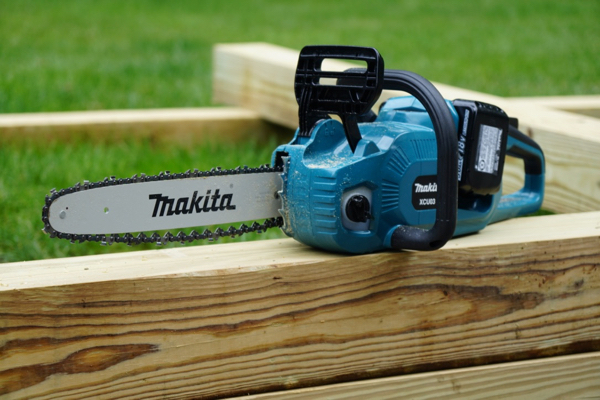 Not with the Makita Cordless Chain Saw, it starts instantly and when disengaged powers down. These two features ensure painless starting on the ground and safe transport of the saw. I found the safety trigger on the top of the rear handle to consistently “disarm” the saw when I wasn’t holding the handle with the intent to engage the blade. This feature prevents any unintentional engagements during transportation. The less time the saw is “running” the safer the operator. Additionally, since the safety disarms the tool, accidental engagements become less likely. Another safety benefit of the Makita 18V X2 (36V) LXT Lithium‑Ion Brushless Cordless 14″ Chain Saw is it requires NO gas. Refueling with gasoline requires a safety can for a reason, gasoline is volatile, can harm your skin, and can limit refueling when the saw is hot. Makita’s 5.0Ah batteries on the Dual Port Rapid Optimum Charger refuels in only 45 minutes. The battery operated tool, with its brushless motor transfers essentially no vibration to the user. The fatigue associated with operating a gas powered OPE is no longer an occupational hazard for landscapers and trades people. Noise associated with these tools is also a hazard for workers. Since switching to a 100% battery operated OPE line up, I haven’t even thought about wearing ear protection while using these tools. Not to say it isn’t recommended, but the point is the noise is dramatically less with tools like the Makita 18V X2 (36V) LXT Lithium‑Ion Brushless Cordless 14″ Chain Saw. The overall performance and capabilities of this cordless chain saw is impressive. 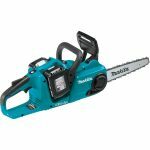 The Makita 18V X2 (36V) LXT Lithium‑Ion Brushless Cordless 14″ Chain Saw cuts quickly. At World of Concrete 2017 we witnessed the saw cut faster than a comparable gas powered saw. Of course you won’t get the same run time as a gas powered tool, and this is essentially the biggest trade off. 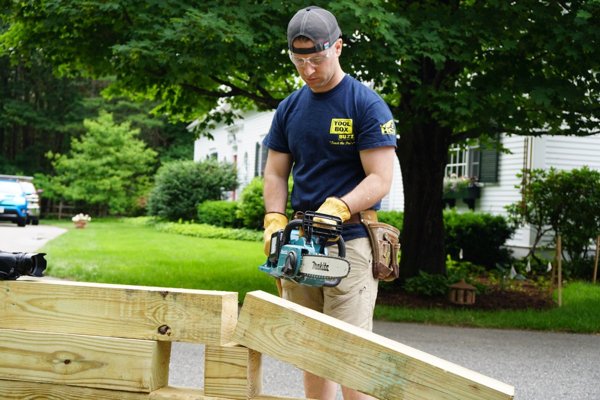 The 5.0Ah powered saw with limited torque feels safer than gas powered tool. 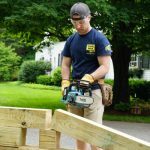 Kick-back is typically the biggest fear of chain saw users, but these cordless tools can still be bogged down. If your cut isn’t clean or you try to force the blade through material the saw experiences a noticeable degradation in performance. Run times will vary dramatically depending on tasks. You can expect to only get a dozen or so cuts out of large diameter hardwood logs. Which for a lumberjack would be unacceptable, but for light landscaping and cutting large timbers you can expect around 2o cuts maybe more. Either way you’ll want to have a back up pair of batteries ready to go and a power source to get your spent batteries back on the charger ASAP. 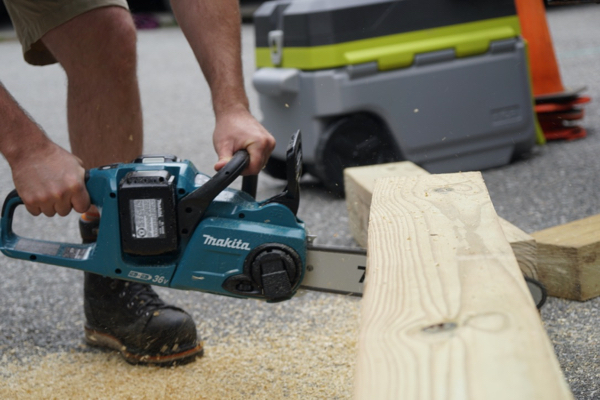 The Makita 18V X2 (36V) LXT Lithium‑Ion Brushless Cordless 14″ Chain Saw is a great addition to Makita’s OPE line up. 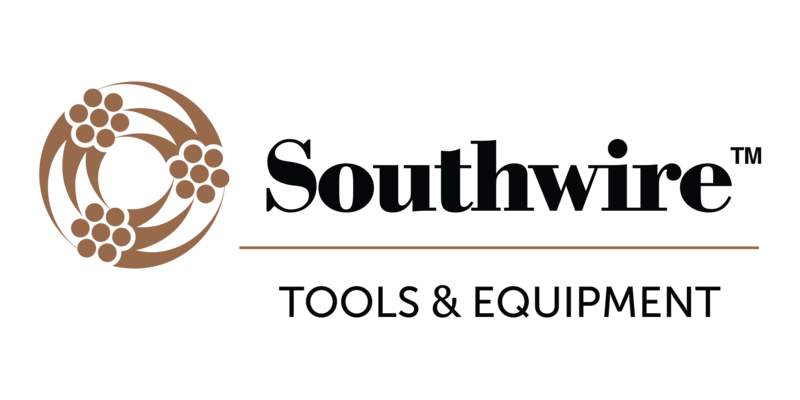 Whether you are a landscaper, general contractor, or homeowner the capability paired with the quiet convenience of a battery operated tool makes this a unique offering. This tool adds the ability to work with zero emissions and very little noise, with the added safety of an electric motor. My overall impression is great, but this may not be the best choice for all chainsaw users. I believe this tool is safer and easier to operate and maintain than gas powered options. A home run for light users of chainsaws, but perhaps still not up to the task for heavier users. The lower noise, lower vibration, and no volatile fuel source cannot make up for the lack of run time. Compared to gas powered chainsaws, the two 18V 5.0Ah batteries cannot keep up. 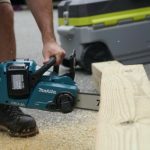 Still the Makita 18V X2 (36V) LXT Lithium‑Ion Brushless Cordless 14″ Chain Saw is an impressive tool and great option for contractors and homeowners alike. 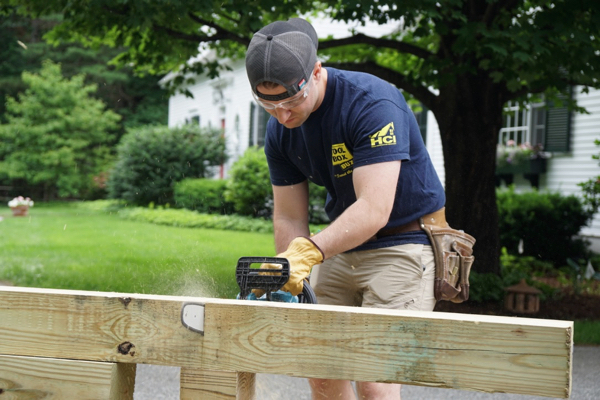 I think the inherent safety and convenience of the tool will make this a more common sight on the job for deck builders, post and beam builders, and even some landscapers! one way to improve this saw is to go to a sthil dealer and order a 14″ bar and 1\4″ chain and sprocket to go with it for their cordless chainsaw….then you have a narrower kerf and faster chain speed plus you can use sthil chain which is a lot better then Oregon…. 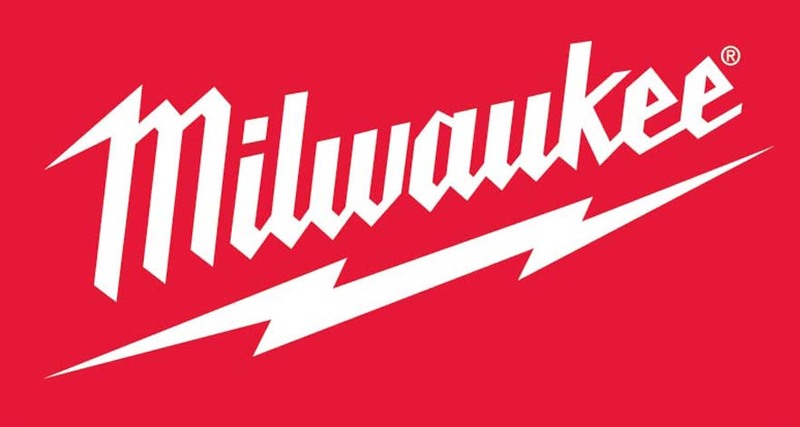 Can you do a shootout with stihl,husqvaran,milwaukee,dewalt,mikita,echo,ego and any other honorable saws . You guys are the best and I always buy according to your test. Thanks. Great suggestion, nothing planned at the moment but we’ll keep that in mind.